When you want pedigree and experience, Öhlins are your best bet. Kenth Öhlins established it way back in 1976, in Sweden and he’s still at the reigns today. They’ve honed their suspension construction to a fine art. Some of the biggest car manufacturers in the world use Öhlins suspension, such as Audi, Volvo, Mercedes, Ford and VW. Also, you’ll find Öhlins suspension enhancing the sports cars and supercars of companies like Ferrari, Lamborghini and Pagani. Safety and build quality are in the DNA of Öhlins. Car parts that are used in motorsport have to have been tested over and over again until it is certain, without a shadow of a doubt, that they will work entirely as intended and won’t break down at high speeds. These parts have been designed to withstand the most stress that car parts can be put under, so nothing you do is going to put a scratch on them. The newest innovations in motorsport technology come to you directly from the R&D department at the forefront of the field. Öhlins have made suspension which works on hard tracks, dust roads and mud. Even though it has one of the most advanced R&D departments in the industry, Öhlins still doesn’t just rely on numbers and data, the feel of the ride is still paramount. They are drivers, too - they speak the same language as us at Tarmac Sportz. Their coilovers use Dual Flow Valve technology, which offers the best balance between comfort and responsiveness. It works by using a damper fluid system that allows the liquid to flow in both directions. In terms of differences you’ll see; easy cresting of bumps and pot-holes, whilst letting the driver retain stability and control of the car. Because they’re so long-established and have this incredible history of automotive success, Öhlins have naturally struck up deals with all of the major car manufacturers in the world. This is to your benefit, because no matter whether you’ve got a BMW 3 Series or a Porsche 911, you’ll likely find the coilover to fit your car. Their range covers BMW, Audi, Mazda, Mini, Wiesmann, Lotus, Mitsubishi, Toyota, Subaru, Suzuki, Vauxhall, Seat, Nissan, Honda and Lexus. 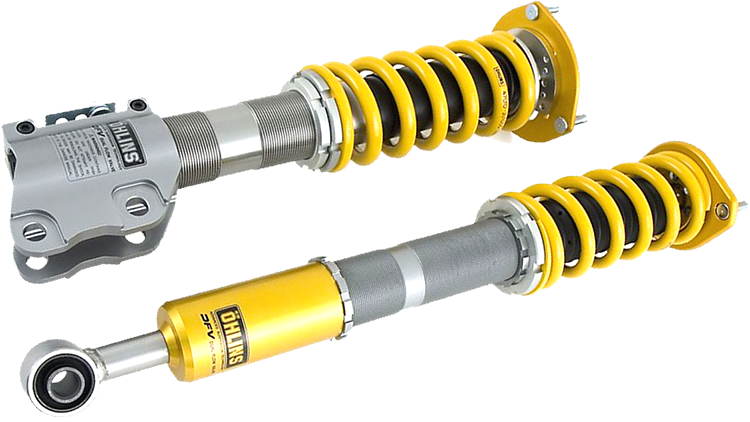 So, go ahead and take a look at our range of Öhlins coilovers, Tarmac Sportz has got you covered.